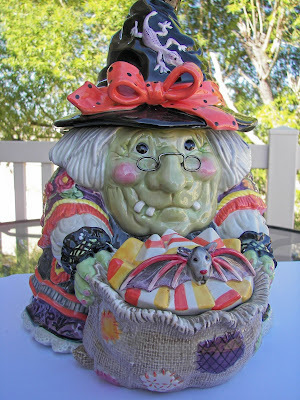 Welcome to Centerpiece Wednesday, Tablescape Thursday and to Zoulah Boulah's Halloween Bash! Zoulah has been all a fuss getting this Candy Corn Tablescape ready; it's her first and she wants to impress you. She chose a candy corn theme because it is her favorite Halloween candy; candy corn also reminds her of witches' teeth. Just don't tell her that, she might take it personal. 1. She chose white square plates, round salad plates, and white napkin rings; they reminded her of the tip or top of the candy corn. 2. 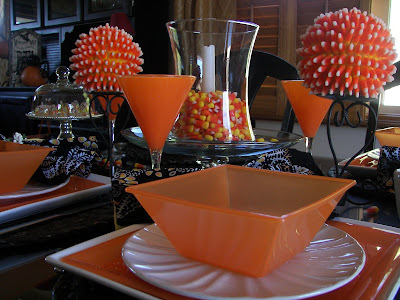 She chose orange plastic plates, bowls, and goblets because they reminded her of the orange center of candy corns. 3. She chose a yellow napkin to bring in the yellow bottom of candy corns. 4. 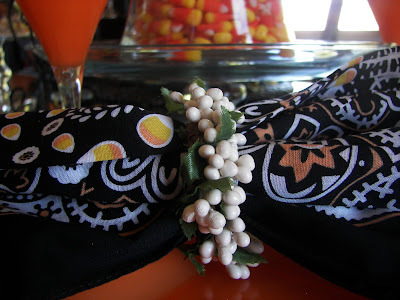 She also paired the yellow napkin ring with a candy corn bandana to pull all the colors together. Zoulah likes being color coordinated. In Zoulah's opinion, the highlight of the table is the candy corn spheres. She had a lot of fun making them; she will post about them later. Zoulah, loves to display candy at Halloween, but she does not like it when the candy bowls are emptied by Joni's family. She thinks candy is a great decoration and should be seen and not eaten. She figured hot gluing the candy to the spheres, MIGHT prevent everyone from eating the candy corn; you never know about that Red Couch family. She also put candy corn in a large glass vase; however the candy corn is not glued down. She will be keeping her witchy eyes on it. She will be especially watching Tati, Polka Dot Pantry Sweets, who kept on eating candy corn while Zoulah was making the candy corn spheres and saying, "I don't know why I am eating this, it doesn't taste good." Yeah, right! Here's an overhead shot. Zoulah, found some yummy candy corn kisses for her table. She is blowing a sticky, candy kiss your way, so please take one. What would a candy corn table be without candy corn cookies -- Zoulah couldn't imagine -- so she tied on her apron, Halloween-themed, of course, and baked up a storm. There they are in the candy corn dish. She wants you to take a few on your way out. She promises to post the recipe and instructions later. Zoulah reminds you that she is guest hosting while Joni sits on her duff takes a break from blogging from now until Halloween. Zoulah says, "I have lots of tricks and treats up my sleeve to share with your readers. Zoulah thanks you for dropping by and reminds you to take a look at all the other Centerpieces at Centerpiece Wednesday and Tablescapes at Tablescape Thursday. Joni, I can't wait to read about how to make those candy corn topiaries! They look amazing -- and labor-intensive! 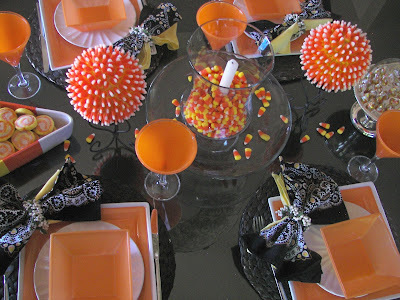 I love all things candy corn, so this table was a delight to explore. What a faboulously fun table! Joni! Hello creative one!! Those candy corn spheres are just the coolest things ever!! Can't wait to see the tutorial on those. I love the square orange plastic plates...the orange goblets, the yummy looking cookies and of course the fabulous napkin rings wink wink. What a fun table and I really love Zoulah! So fun!! Thanks for linking up to Centerpiece Wed and showing your creativity! Awesome ideas!! OH hey Joni..do you go to the witch days at Gardners Village? I have gone once and even dressed up! It was hysterically fun. 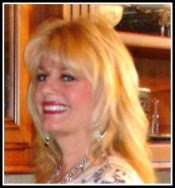 I will be in SLC for Halloween this year visiting my little grandkiddies! I can't wait! I just wish my house would sell so I could move there soon. i'm lovin' the candy corn balls...i would make them, but i think with my history with candy corn, it might not be a good idea to have that many bags in my possession. i do love candy corn! cute tablescape. 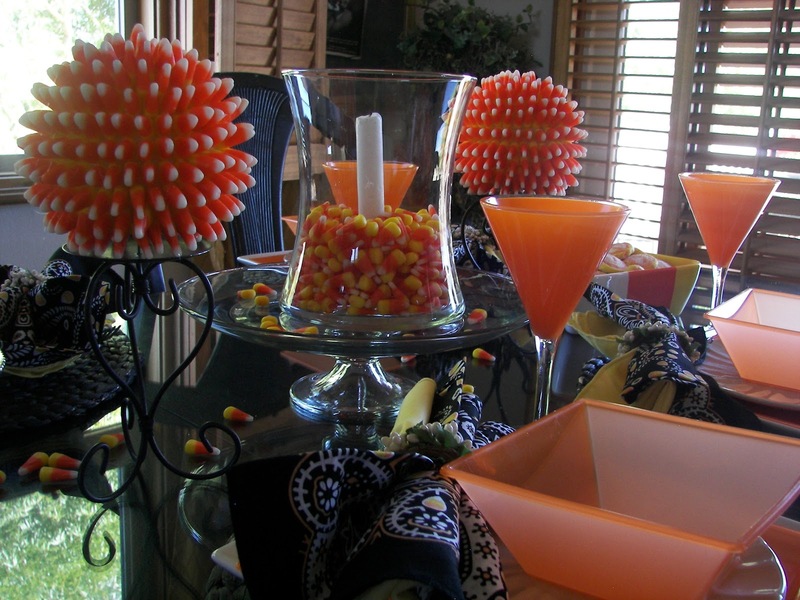 Cute, cute table, Joni...love the candy corn orbs. Did you actually use hot glue, the candy corn didn't melt? Too cute and yes I would love the candy spheres but too eat! I love candy corn!! Love the candy corn topiaries, Zoulah! Thanks for helping Joni out! Very colorful and creative table! Laughing at Happier than a Pig in Mud's comment. I love this whole table and can't WAIT to tell my husband about it. 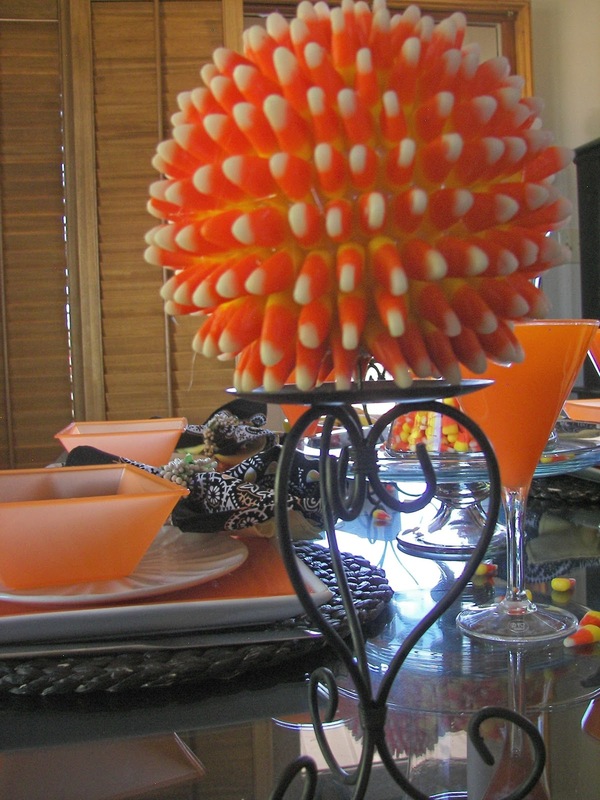 He has been teasing me that we need to do a candy corn table. (Because it's his favorite candy). This is just darling and creative and brought to the smallest detail. I really love it! Zoulah has done an outstanding job with her candy corn themed tablescape! And with food to "match"! Love the CC spheres - very unique and look great on the pedestals! The napkins are perfect! Happy Fall! cute candy corn - I've done the gumdrops at Christmas, I might just have to try the candy corn. Absolutely darling!!! 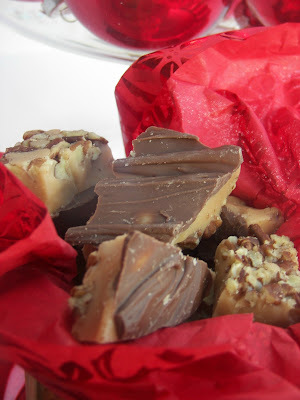 I'm not sure I could leave enough of the candy out of my mouth to create so many cute pieces!!! Well done! Tell Zoulah she sets an AWESOME Halloween table! EVERY aspect of it is just fabulous! I can't wait for the post on the candy corn cookies...they're adorable! This is adorable!! I can't believe those candycorn sphere!! This is just so charming...makes me want to dig into a bowl of candy corn! Boy, I don't think I'd dare eat candy corn with zzzZoulah around! The topiaries took my breath away as your post opened. 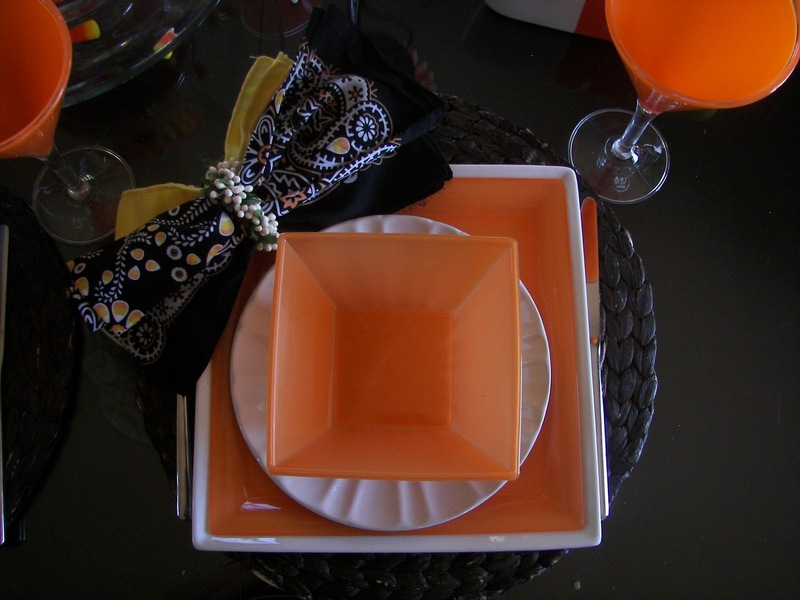 How fun, I love the orange plates and bowls and those bandanas are too cute too. This was really a fun post. You never run out of clever ideas. How creative! I love this. You did a fabulous job and all the accessories are just adorable! I love Halloween and this table scape is just perfect! So cute!! Such a CORNY and cute post...love everything about it. Looking forward to more! Too cute! Love all the orange, black & candy corn! WOW those candy corn balls are awesome! They really caught my eye! A sweet & gorgeous... I love to taste the candy corn balls. They really are awesome. Those candy corn balls are too cool!! Lydia's show and tell today had to do with the letter C and she is bringing. . .candy corn! Unfortunately, mom ate all that we had in the house. So, she sent dad out on a late night run to find more! Wow, what a fantastic and clever tablescape. You've taken candy corn to a whole new level. Love the Halloween theme on your blog. Who ever thought so much could be done with candy corn! Really SWEET ideas! Thanks for sharing your table is great. Eeekkk love the candycorn sphere's!! Such a fun whimsy setting! Great job. 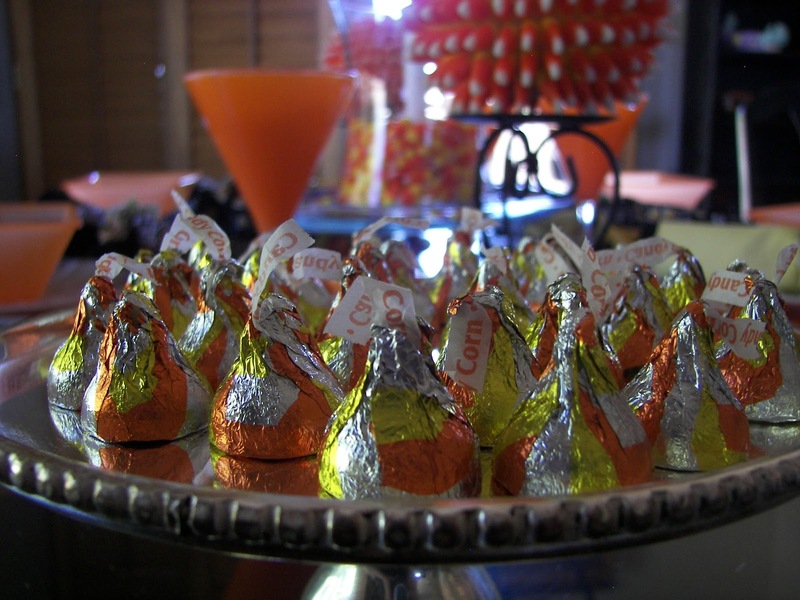 I love candy corn, but I was afraid to buy those candy corn kisses. I didn't want to mess with my chocolate fix. 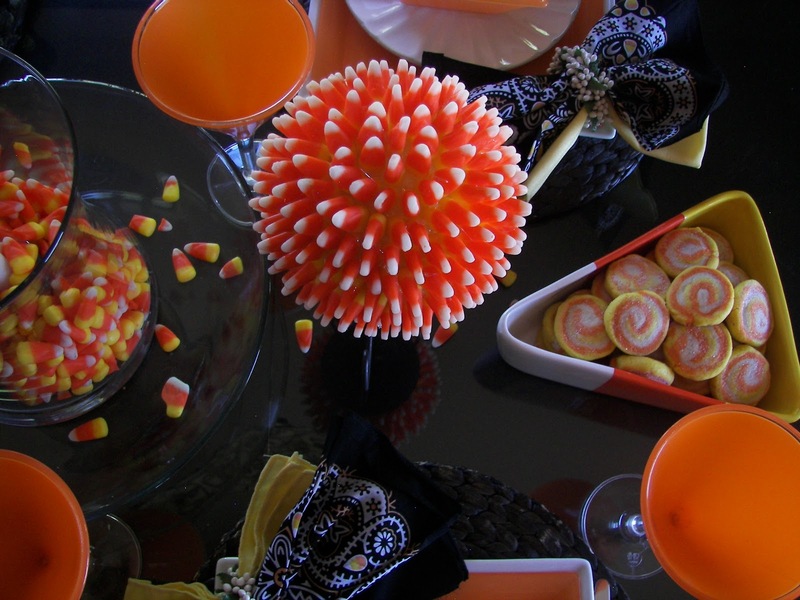 Also love the candy corn sphere. I was lovin' the table until I saw the spheres. AMAZING AWESOME - coolest thing ever! I have got to try it. And candy cane kisses - toooooo coooool! What an amazing candy corn display -- those topiaries are truly creative! So how many candy corns does it take to make a "corn ball"? That is so cute! Love the topiaries. I do a candy corn table too...coming soon! Yours is so glam! Love it, this is really fun for Halloween. The candy corn globes are so great I have to make those! Thank you, Joni and Zoulah! I may just have to have an October dinner party to use your table ideas. Joni, I love your woven web of a story, i love your table, i love the candy corn and I love Zoolah.. This is remarkable. ps. I am a Halloween addict myself! This is adorable! I featured it on my blog so I wouldn't forget to try it sometime! Hope you don't mind.